I’m in the midst of an experiment this month. I can’t say too much about it since it’s still early days into it. But I can tell you this: I’m playing around with a new tele-circle format for the Women’s Creative Wisdom Circles that makes them accessible to women everywhere, not just in Northern California. If all goes as planned, I’ll be opening the doors in 2015 and welcoming in a small group of women to the Women’s Creative Wisdom Tele-Circle. One of the things I love most about the circles is that I get to be both facilitator and participant. And what a delight it is to be doing this experiment right now and circling up with another group of amazing women. There’s truly nothing like a women’s circle to bring you back to yourself, to the life force of creativity, to the pleasures of savoring. Turns out I especially needed to remember this, because I spent far too much time working in June and July. The months seemed to race by. 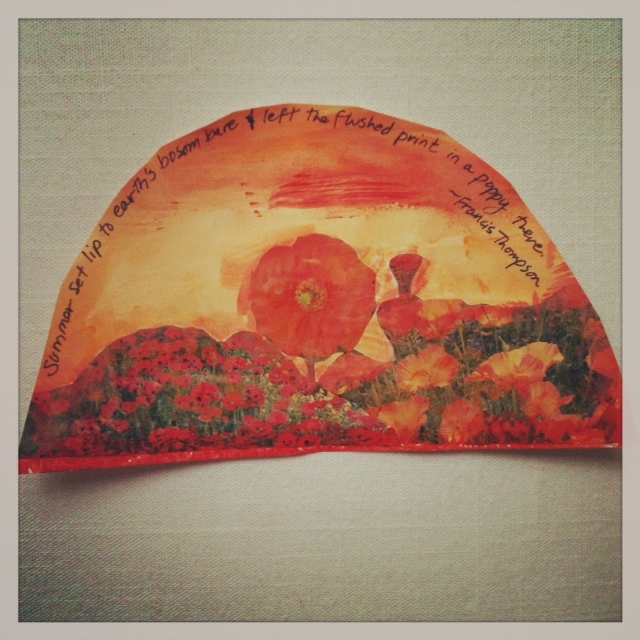 So now I’m slowing down August by savoring and creating. I’ll be savoring by sipping coffee where the Russian River meets the Pacific, walking a labyrinth or two, free-writing with abandon and making sure to catch the Perseids. As for the creating, well that’s already started. 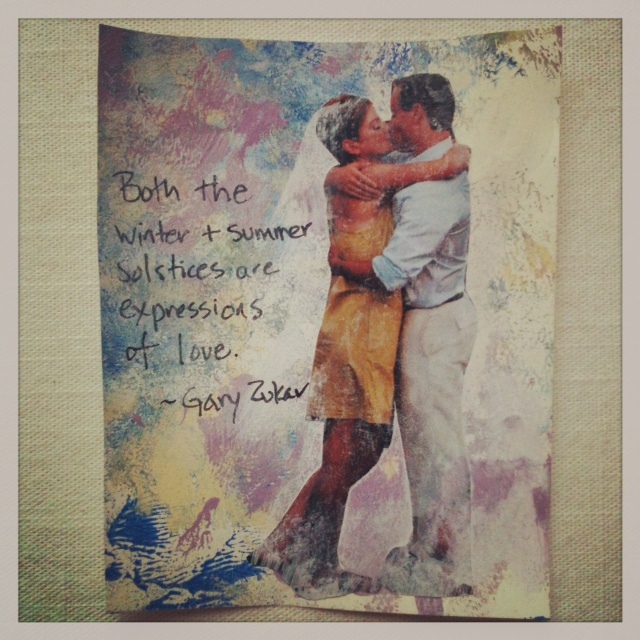 Right after I started the women’s tele-circle experiment I became enchanted by the idea of gathering up a bunch of summer quotes and illustrating them with small, mixed media collages. These collages are quick, fun, easy to make and I’m having a blast with them. 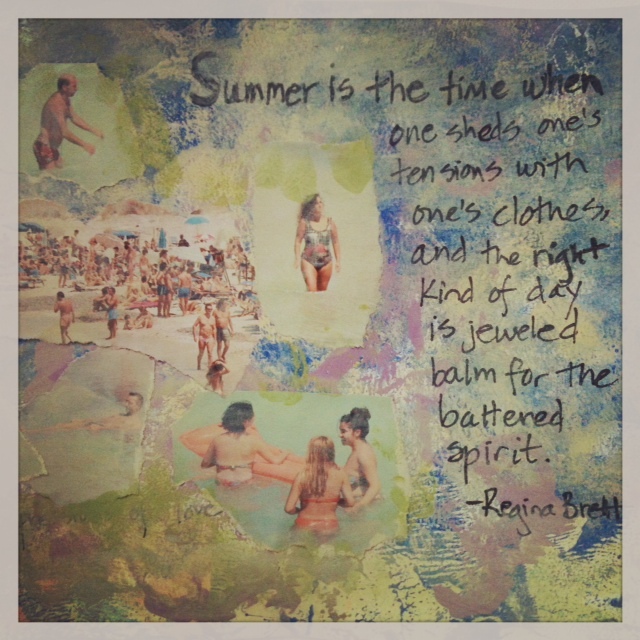 I expect to make more of them throughout the month, posting them to my twitter feed with the hashtag #summerquote. In the meantime, I’d love to hear how you’re savoring and creating in August. P.S. If you’re intrigued by the idea of coming home to your own deep, creative wisdom and being part of an intimate women’s tele-circle, then make sure you’ve subscribed to my newsletter here. Space in the circle will be opening up in 2015. Thanks so much for your kind words Sara. And you are not being too presumptuous at all. I haven’t even thought about someone copying them, probably because I fly pretty low under the radar. I don’t think too many people actually see these bits of process art. But it’s definitely something to consider. Oh, I guarantee if someone comes here, they will see these as works of art:~) You are very talented and deserve credit for your “works of art.” If you have any questions about how to put a copyright symbol on your art, just let me know.